Mountain Views, Close To Downtown, Sleeps 10! 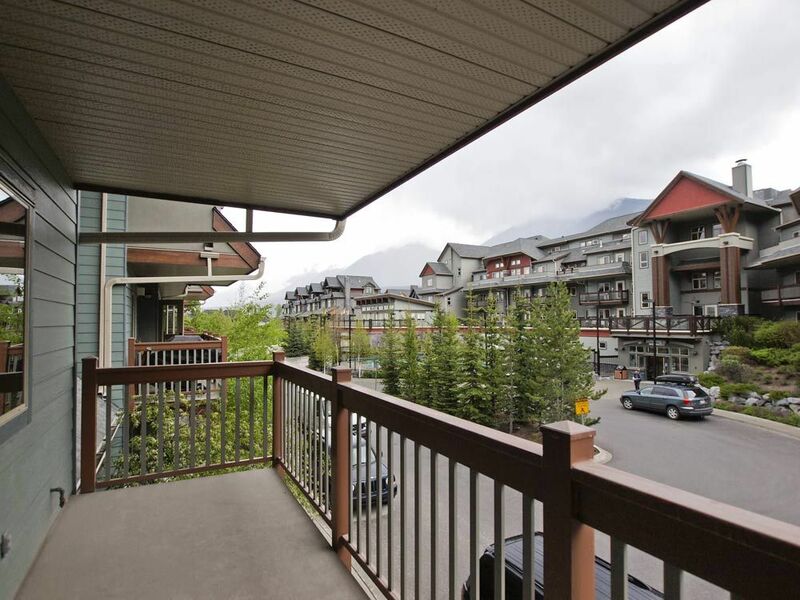 3 bedroom, 2 bathroom condo that sleeps up to 10 has great views of the majestic Canadian Rockies. This brand new unit features a master bedroom with a king bed and four piece ensuite as well as a TV and blu-ray player. The third bedroom contains a twin over full bunkbed, a daybed, a chest and a TV and blu-ray player. The main living area has a pull-out couch, two chairs, coffee and end tables facing the natural gas fireplace. There is a 46 inch LED TV and blu-ray player for if you ever get sick of looking out the windows at the gorgeous mountain view. The spacious kitchen has stainless steel appliances, maple cabinetry and is well stocked to enable you to cook great meals. There is a small eating bar for casual snacks. The eating area has a table with six chairs. The balcony off of the main room is a great place to enjoy the views, read or relax with a hot or cold beverage in the three piece patio set. There is also a natural gas BBQ for your convenience. The unit is located in a family friendly complex and the quiet time is from 10pm-8am daily. We had a great stay in a beautiful condo for our vacation in Canmore. Perfect for our family of 7. Kids loved the pool and we loved the in-suite washer and drier. We had a great time at Blais’ property! It was clean and quiet and had everything that we needed. The heated pool was a plus and we made use of the hot tub as well. There were 9 of us (5 adults and 4 kids) and we fit very comfortably. My only critique was the quality of some of the furniture, which Blais was very receptive to hearing about, including the kitchen chairs which need to be replaced. Overall highly recommend and we would stay again! Clean, tidy. Enjoyed hot tubs & underground heated parking!! Great location and value. Condo has everything needed for cooking. Beds were all comfortable. Would recommend! The property is nice, tidy, quiet and warm. Good kitchen facilities. Indoor garage also let enter the property easily even under heavy rain or snow. This condo is perfect for a family of four or five. It's a walking distance to Canmore and coffee shops. The underground parking makes it very convenient. We will be back!